Energy workers are drowning in a sea of cheap oil. 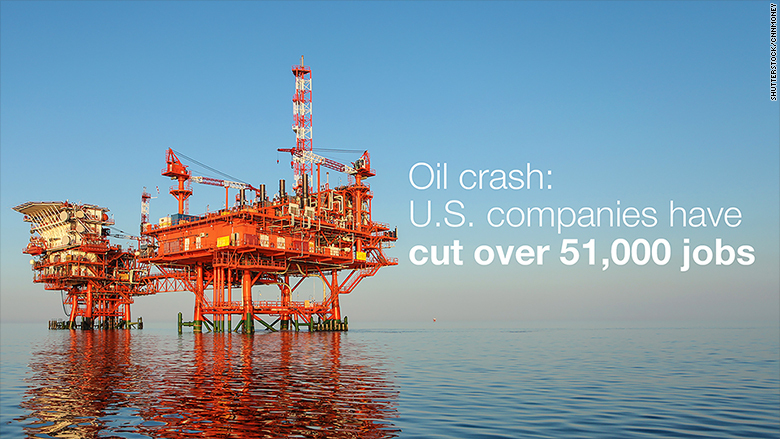 Pink slips are flying out at warp speed at U.S. companies linked to oil. Crude oil prices nose dived to around $50 a barrel, after peaking at $107 last June. In response, companies have taken an ax to their spending budgets and have cut jobs in the previously-robust energy industry. Since June, American companies have disclosed 51,747 job cuts directly attributed to falling oil prices, according to data provided exclusively to CNNMoney by outplacement firm Challenger, Gray & Christmas, which closely tracks U.S. companies. The vast majority of the layoffs -- 47,610 -- have been announced this year as oil prices have struggled to climb back up from the depths. "This industry has always been subject to boom and bust," said John Challenger, CEO of Challenger, Gray & Christmas. 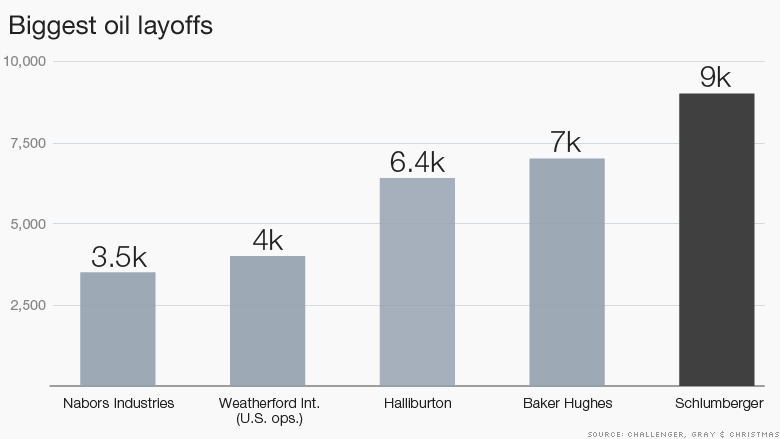 Layoffs up 3,900%: Oil job layoffs in the first three months of the year rose an eye-popping 3,900% from the same period a year ago, Challenger said. The downsizing in the energy market is starting to appear in broader government statistics. The mining industry, which includes support for oil and gas extraction, has lost 30,000 jobs in 2015, according to the Bureau of Labor Statistics. Frontline jobs first to go: Workers at oilfield service companies have felt the most pain as oil operators are the first to scrap projects. During the first quarter Schlumberger (SLB) announced plans to lay off 9,000 workers, rival Baker Hughes (BHI) cut 7,000 positions and Halliburton (HAL) said it would slash 6,400 jobs. Shale oil is expensive to extract, so it also needs loftier crude prices to turn a profit, which means that workers in shale oil have been particularly slammed. Steep wage cuts: Temporary energy workers have been forced to accept wage reductions of between 10% and 15%, Read said, adding that deeper cuts of up to 25% aren't uncommon. "People in the industry are taking it on the chin. Most people are realistic. They had it very good for a number of years," said Tobias Read, CEO of Swift Worldwide Resources, a major oil and gas manpower provider. From job creator to job slayer: The deep downsizing represents a huge reversal of fortunes for the energy industry, which had been a major creator of jobs as North American oil production skyrocketed during the shale boom. Oil and gas extraction employment had been growing at twice the pace of all jobs in the broader economy since the end of 2011, according to government data. "The pendulum has dramatically shifted to the other side," said Read. Is the worst over? The good news for energy workers is that the pace of job cuts appears to be slowing. In March there were 1,279 job cuts announced, down 92% from February, Challenger said. The bad news is that if oil prices won't climb back up, some large players will also join the job cutting crowd. Major operators Chevron (CVX), ConocoPhillips (COP) and ExxonMobil (XOM) have yet to reveal large-scale downsizing, although that may soon change. "I'm expecting the operator community to probably go through a reasonably substantial staff reduction in the second quarter," said Read. He expects these established companies to offer their employees voluntary and early retirements. 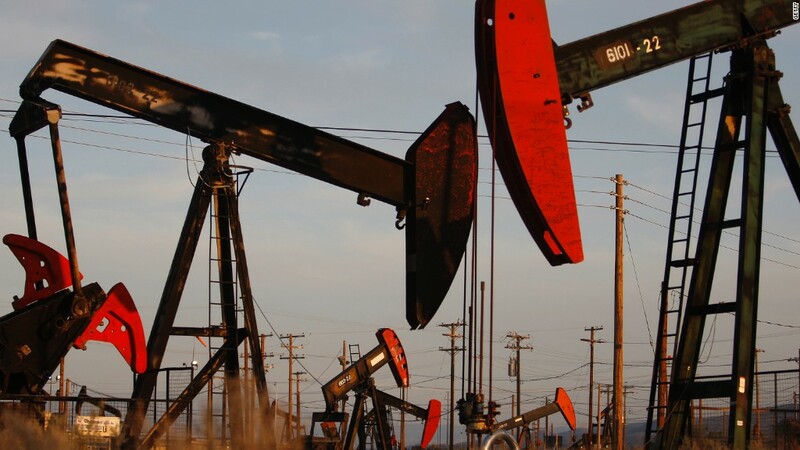 Another concern is that many oil drilling projects are coming to an end. Once they're completed, workers won't be able to find new jobs because most companies aren't starting new drilling projects. "The more projects that finish, the more people that will be sitting on the bench," Read said.